This image source supports image which have a multi-component pixel equal to the image dimension, and variable length VectorImages. It is recommended that the component type be a real valued type. Definition at line 38 of file itkPhysicalPointImageSource.h. Definition at line 47 of file itkPhysicalPointImageSource.h. Definition at line 55 of file itkPhysicalPointImageSource.h. Definition at line 50 of file itkPhysicalPointImageSource.h. Definition at line 51 of file itkPhysicalPointImageSource.h. Definition at line 46 of file itkPhysicalPointImageSource.h. Definition at line 54 of file itkPhysicalPointImageSource.h. Definition at line 52 of file itkPhysicalPointImageSource.h. 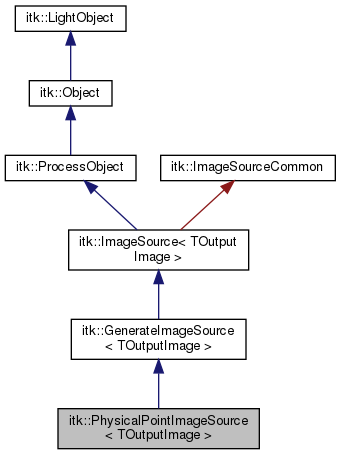 Definition at line 44 of file itkPhysicalPointImageSource.h. Definition at line 58 of file itkPhysicalPointImageSource.h. Definition at line 53 of file itkPhysicalPointImageSource.h. Definition at line 45 of file itkPhysicalPointImageSource.h. Definition at line 67 of file itkPhysicalPointImageSource.h.